President Fernandez presented certificates of recognition to several personalities of the stage and screen who have promoted the Dominican Republic as a film location. The Eduardo Brito Room of the Teatro Nacional was decorated for gala to inaugurate the Dominican Global Film Festival with a showing of Andy Garcia’s "La ciudad Perdida" and a ceremony in recognition of filmmakers and artists who have promoted the Dominican Republic as setting for films. The evening began with a walk down the red carpet by artists, businesspeople, politicians, and other national and international public figures. President Leonel Fernández and First Lady Margarita Cedeño mixed with key participants in the Festival including Andy Garcìa, Emilio Estefan, Sammy Sosa, Zoè Saldaña, Diana Ramírez, and Juan Fernández as they greeted the press and moved to enter the Teatro Nacional. 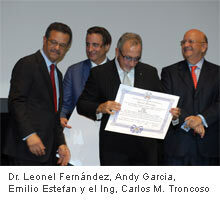 After Despotovic’s opening words, President Leonel Fernández, who also serves as Honorary President of FUNGLODE, proceeded to the presentation of certificates of recognition to Andy García, Luís Llosa, Alejo Menéndez, Emilio Estefan, Claudio Chea, Robert De Niro, Jaime Piña, and (posthumously) Colombian actress Victoria Kluge for their many contributions to Dominican cinema. President Fernández also explained that his administration seeks to turn the Dominican Republic into a mecca of Latin American film and referred to the Festival as a tool to promote the DR abroad. "There is a history of Dominican film both nationally abroad. What has been missing is the consolidation of the film industry. It is therefore the goal of the government to create the conditions necessary to facilitate the development of the Dominican film industry, thus providing talented and creative young people with a vocation and enthusiasm for film with the opportunity to realize their dreams". In his speech, Fernández spoke of the importance of investing in human resources in the area of film given that the industry can be an innovative and attractive source of employment, especially for young people. The President explained that through the Film Festival, FUNGLODE seeks to reach the youth of the DR, broadening their vision of the world and encouraging their creative spirit. "We hope that this will be an exciting and gratifying experience for film professionals, young people, and the general public in the Dominican Republic as well for our international guests who honor us today with their presence". Presentation of "La ciudad perdida"
Following the speech by President Fernández, Andy García presented his film, "La ciudad perdida". Moved, the Cuban actor and director gave background about the movie, which was shot in 35 days of intense on-location filming throughout the Dominican Republic. García explained that the support he received while shooting in the Dominican Republic has led him to widely recommend the country as a site for filming to other moviemakers. After presenting several actors from "La ciudad perdida" who were also present at the Festival, García shared, his voice marked by emotion, that he had spent "the best moments of my creative life" in the Dominican Republic.